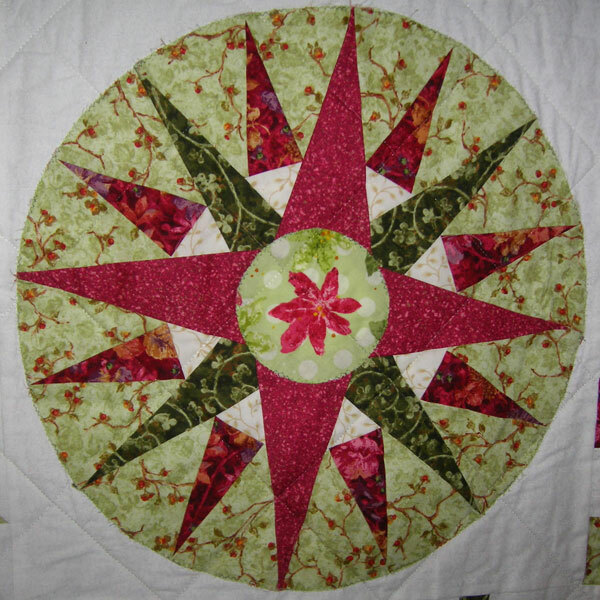 Janita’s chosen quilt is a ‘block a fortnight’ sampler quilt including a Mariners’ Compass, Flying Geese and Broken Dishes. She talks in detail about making the blocks and constructing the quilt. Later she talks about getting into quilting and ‘the slippery slope’ which led her to a new sewing machine and joining a quilting group. Jan also discusses some other techniques she enjoys including appliqué and redwork, as well as the hazards of Bondaweb. Kathy Hunt [KH]: This is an interview with Janita Jenkinson. I’m going to call her Jan. the ID number is TQ.2016.024. 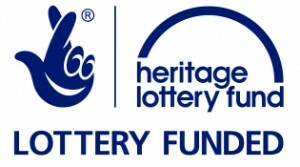 We’re in the home of Jan and we are in Broughton Green, which is near Droitwich in Worcestershire and the date today is the 27th May 2016 and I’m Kathy Hunt. Welcome to Talking Quilts, Jan. I’m very impressed with this quilt that we have in front of us and I wonder if you’d like to describe it to me. KH: Could I… excuse me… I need to know what you mean by fussy cut. JJ: Fussy cut means I’ve looked for a, for a looked for a specific part of the, of the pattern and cut that, that out. So if I said that in the Mariner’s Compass which is round, the centre has been fussy cut to give me a flower in the middle. JJ: This, this quilt was made so that I could learn different techniques. I’ve been quilting five years… just over five years now. And when I came to making this quilt three years ago I decided that I needed to do something to learn the different techniques of quilting. And so I chose different patterns, some easier than others, some gave me a great headache, but I think I achieved what I wanted to achieve in the end. It’s made up of various different blocks, obviously, being a sample quilt. I think there’s nine in all, maybe ten, if I count them properly, and it’s something that I really enjoyed doing. And I think the first thing I enjoyed doing was choosing the fabric. KH: What sort of fabric have you chosen? JJ: Right. I’ve chosen greens and a deep… I think you probably call it cerise pink. There is one pattern fairly plain, the greens have got sprigs of flowers on, another one has got … is a darker green again with, with a leaf motif. There… the cerise are flowered and for the border I have chosen a fabric which match… which tones in which has all the greens and the cerise in it, so it, it all matches together. And that’s all happened by good luck when I went to the Malvern, the Spring Malvern Quilt Show, walked up to… I don’t know how if I’m allowed to advertise. KH: I’m sure you can. JJ: Up to Doughtys and there were the bolts of fabric. And there was no… it was, it was just there. The choice was there and I knew that was what I wanted straight away. KH: The quilt measures about 50 by 50 inches, doesn’t it? KH: Can you tell me how much fabric you felt you needed to buy and whether you had any leftover or…? JJ: I must have been a good guesser [chuckles] because I didn’t have much left over at the end. In fact, I ended up using little scraps in part to, to finish it. I think for the backing I probably bought two or three metres for the backing and probably a metre of each of the other fabrics. Maybe, no, maybe half a metre of some and a metre of others which I thought I would use more of, like the one that’s gone on the, on the binding and the fillet. So, yeah, probably… that’s that’s probably what I bought in the end. KH: And would it be safe to say that they’re cottons and that they were 45 inches wide or something like that? JJ: Yes. Yeah. And I’ve omitted to say that the background is a cream on cream, so that’s, that I probably bought two metres of that just to be on the safe side and I did have some of that left. KH: Can you describe some of the blocks that are in it then please? JJ: Right. One of the larger blocks is a Mariner’s Compass. Obviously that has got the, the points of the compass and they are in the deep cerise. The… I think you would… I’m not quite sure of the technicality of the terms that you use for them but that’s the north, east, south and west. 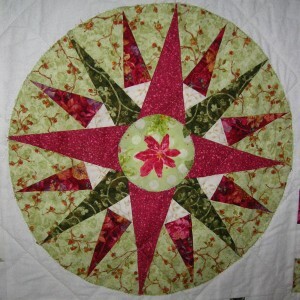 The north [sighs] the north east points that’s in a dark green and the north, north east, again in a cerise with flowers and the background to that is the green fabric sprigged with flowers. KH: What method of piecing did you use for that ‘cause it’s a circle and it’s quite a difficult block, isn’t it? JJ: It is. Yes. It was all machine pieced. The triangles were most… the triangles were obviously cut and then pieced in. The centre which has a fussy cut flowering that was appliqued onto the top and I drew… after I’d done that, I drew a circle round using a piece of, of thread attached on a pin attached to a pencil to make sure that I had got the… a circle and then cut that and appliqued that onto the background. KH: Is that done by hand or machine? JJ: That was done by a machine using, using buttonholes, no, using a zigzag stitch. So that was all zigzagged on and the centre was zigzagged as well. I had a go at making bias binding and half inch bias binding and with that I did a Celtic design in the cerise, the dark green and the greens. That I found a bit challenging to start off with as it all has to be interwoven and just getting the fabrics in the right order onto the background took a little bit of doing, especially as I had to hold the background fabric up to a window and trace my design on from… on the top so that I at least knew where everything was going or should have been going. I think that involves pulling out a few times, and that was just machine stitched on to the background. KH: So, do I understand that correctly? You had a square of background fabric, you put the bias binding… the woven… you wove the pieces of bias binding on there and then you stitched all that down? JJ: It had to be stitched in a certain order otherwise you, you ended up… as it’s woven through you had to, you had to stitch in a certain order to make sure that you… that the pattern was there and that you didn’t have stitching going over all the different, different interwoven pieces of binding. KH: So how long would that have taken you to make? JJ: That took about three days. That involved the pulling out and the getting cross with it and nearly throwing it out the window [laughs]. JJ: Yeah. And another thing that I did for really for the first time and which I’ve developed a love for now, is applique. I have done a circle of flowers, again with handmade bias for the stem going round and green leaves. And that was all appliqued on using Bondaweb and I think that was buttonhole stitch. Yes that was buttonhole stitched round onto the, onto the background fabric. Again the, the design was, was drawn onto the background fabric and the pieces placed on in order. But that was most enjoyable and I’ve done quite a lot of applique afterwards. Flying Geese, another one that I’ve done, that’s… they’re in different colours, in all the different fabrics. That again was a technique I hadn’t done. KH: Can you assume nobody knows what Flying Geese are and tell us what they look like please? JJ: Flying Geese are triangles and that it’s, it’s a rectangle of background fabric joined, joined together. Each little rectangle has got a triangle on the top. There are different methods of making Flying Geese and I think that was just the basic, basic version. Can’t actually remember how I, I must be honest and say I can’t… without getting the instructions out, I can’t remember how I did it [laughs]. But I’m sure once I do I’ll know how to do it again. So they’re virtually triangles coming down in a long line and those are the, the Flying Geese. I did some English piece, piecing to make the two stars. That I found quite a fiddle getting the centres to join up nicely and that involved quite a bit of unpicking until I’d done that. That, of course, being where you cut out your paper pattern, your paper of the diamond and stitch it and put your… fold your fabric over and then hand stitch all the pieces together. So that was quite, that was quite interesting. I’m trying to think now. There’s another one, which is Broken Dishes. It’s the… that again is made with half square triangles to give the pattern almost of like a kite almost in the middle and that I used a back cream with sprigs of flowers on, which I hadn’t used, in fact, very often. I think there’s only about two or three blocks with that, with that on, that was just to give a little bit of contrast. Another one that I did was the Bow Ties. They, they were made by four, four squares of material, and another smaller square stitched over the top to give the impression of a, of a tied bow tie. I’ve also done some Seminole, that was another first, which I think looks rather… has worked out quite well. Again with the different, different fabrics but the, the deep cerise being in the middle of each one. There is a Star Block also down the, down the bottom corner that has got a large centre square which again, I fussy cut to get a green leaf in the middle. And then a lot of those were made by half square triangles and also a rectangle where I had joined, joined another square on to make a… and then, then flipped it to make a, to make a triangle. There is the Card Trick. That is four different, four different fabrics placed on one another to resemble the four suites of the… of a pack of cards. And that was made using half square triangles and place, you know, placing them together so that they overlapped. There’s also some strip blocks down the bottom corner which have just been put together to make two squares in different, in different colourways. There again they’re just, they’re, they’re machine pieced. There’s also the Drunkard’s Path. That, you can put together in several different ways. I’ve done it with… to get the… with four fabrics and the circle pointing outwards. That… the circle part was definitely the most difficult to do. So I found that quite difficult because that was machine pieced, that isn’t appliqued on, that’s, that is machine pieced and again I think I, I trialled that out on another piece of… on some oddments of fabric just to make sure that I could do it. Not the easiest thing to do. I’ve also got a Twisted Star, star at the top. That again, is made with half square triangles and to make… using a diamond shape as well as a triangle. And that again, when the diamond shape was using… the placing a, a square on top of a rectangle and flipping to get the desired effect. And I think that fairly describes all my blocks, apart from one in the top corner. A large one which I’ve put a question mark by because, for the life of me, I cannot, I cannot find where I got it from or what it’s called. All I know is that I’ve got the, the pattern which I put onto a piece… onto paper and then cut out leaving a half a quarter inch seam allowance round. And I’ve absolutely no idea where it came from or what it was called. But it was quite effective [laughs]. KH: I have no idea what it’s called either but I would describe it as being a four pointed star with a square sort of overlapping it and then there’s a central pattern as well. And it’s quite complicated but I’m afraid I’ve never… I’ve no idea what’s in these either. JJ: No. I obviously found it somewhere, thought it looked good and decided to have a go. KH: Right. So you chose these various blocks from a repertoire of maybe people suggested them to you. Is that how you got there? JJ: We were… this was done at Bearley Babes and we were given a selection of blocks that we could… we were… that suggested might go together. JJ: But, they… you weren’t obliged to use them, you could do what you wanted, your own colourways. How you put them together was your own choice. What you did with the binding and the border, again your own choice. I chose to put a fillet round mine. KH: What is a fillet? JJ: A fillet is a piece of a strip of material, a long strip of material which breaks up your main quilt from the border. It’s often a solid colour. So it, it just gives that little break between the border, which in my case is quite busy, and the centre of the quilt which is actually quite busy as well. But it does, it does define the middle from the, from the edge. KH: And how is that done? JJ: That’s done with a long length of material. I think that must’ve been… that was an, an inch wide folded and ironed and then stitched onto the… the quilt was cut to the size that I wanted it. The inner was cut to the size I wanted it. The strip of material was then laid along the edge of the material and I sewed in a quarter of an inch in. So that then when the border was attached you made sure that you sewed over the same amount… the same line of stitching, flipped the border back and you have the, the narrow, delineation between the, the quilt and the border. KH: Right. Okay. And then how’s it bound? JJ: It was bound in the same, in the same fabric as the, as the, as the fillet. That again was two, two and a, two and a half inches of fabric. 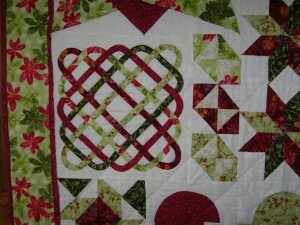 The length of the joined in long lengths or to make a long length that would go around the entire quilt. And that was joined… I’m not sure of the technical term for it, but using a diagonal, a diagonal so that it, it gave almost like bias, it gave line all the way round. That was then folded in half with a good iron to make sure that that was down there. That was then sewed on with a quarter inch seam and that would have been flipped over the quilt and hand sewn onto the back. KH: And the corners are mitred? JJ: And the corners are mitred, yes. Yeah. KH: Gives a nice finish doesn’t it? JJ: A darker thread on the bobbin, yeah. KH: Is there a label on the back? JJ: There isn’t I’m afraid. I haven’t made one as yet but I am going to [laughs]. KH: Does the quilt have a name by any chance? It doesn’t have to. JJ: It doesn’t, it doesn’t really have a name, no. It’s just a sample quilt which I’ve enjoyed doing and I suppose you… I don’t know. I don’t know, I’ve never thought of giving it a name. KH: Oh well. I suppose you could just call it a Sample, The Sample Quilt. JJ: Yeah. The Sample Quilt. Jan’s Sample Quilt [laughs]. KH: Now how, how long do you think it took you to make it? JJ: I think about six months in all, but I was doing other things at the same time. I’m not one for sticking to a project. I dabble. So, yeah, I would’ve done some of that, done a block and then gone on and done something else and then come back and done another block and laid it out all over the floor and decided how it was going to go together. And miraculously it did [laughs]. But, but I had to move pieces round to get, to get it how I wanted it. KH: Well, it’s quite tricky to put… ’cause you’ve got quite… your, your blocks aren’t all the same size or shape are they? KH: What wadding have you used? JJ: It was Soft and Bright. It was polyester Soft and Bright wadding which, which seemed to work quite well and I do use that quite a lot. KH: Did you have a use in mind for this when you made it or did it… what do you use it for now? JJ: It’s, it’s on the back of the settee in my office and work room upstairs. So, yeah, it’s, it’s… I see it every day and I like it… to see it every day [laughs]. KH: That was going to be my next question. JJ: I’m very, I’m very… to be honest I’m very proud of it. It taught me a lot and I did enjoy doing it. KH: Can we talk a little bit about when you first started making quilts, and your background? How you came to quilting. JJ: I’ve always been an embroiderer. I’d done kind of tapestries, cross stitch. I’ve started off on cross stitch, went on to tapestries and then on to more creative embroidery. I did at one stage belong to Forge Mill Embroiderers but, a voluntary job got in the way of that and I gave that up. I also went to, belonged to Saint Lawrence Church in Alvechurch Embroiderers and they… that was how I got into quilting. They invited me to go to West Hope College with them when somebody dropped out. And our tutor was Alison Crisp who was making a bag with us. A bag, which I must say, I take to quilting with me every day, every… well, not every day, every week, that I’d never quilted before, she told us to find a lining fabric for this bag. Gave us, told us how much material we needed. We had to get a lining fabric and three other fabrics or some charm squares but I wasn’t sure what charm squares were so I bought fabric instead. And, I turned up there with my machine, my basic machine, I must add, as this was a very slippery slope, which didn’t do a lot except sew in straight lines and a bit of buttonhole and a bit of, you know, kind of whatever. KH: So presumably it didn’t have a walking foot? KH: Perhaps we ought to say that Bearley is a village outside Redditch and that on Wednesday… well Wednesdays for most of the day a group of ladies meet in the village hall. Tell, tell the rest, it’s not up to me [laughs]. KH: Would you say this is a fairly typical story for quilting these days? JJ: I think it’s a very typical [laughs] story for quilting. I was very lucky in that I have, now have two machines. Because I got this one machine and a neighbour of mine, who had a… has a holiday home here in the courtyard of barns that I live in but lives most of the year in Maui [laughs]. One might think it a very strange way round but there we are. She separated from her husband and they were, they were selling up the barn. She gave her sewing machine to another neighbour who brought it to me and said, ‘Do you want this ’cause if you don’t want it, I’m going to give it to a charity shop?’ It turned out to be a Bernina [chuckles]. So, I tried not to look too enthusiastic at the point and said, ‘Yeah. I’ll give it go, see if it works alright.’ Which it did. And, that’s how I acquired my Bernina. That I don’t take to Bearley because I find it too heavy to carry up and down stairs and out to the car. So I have a, Janome which, which I like as well. So, that was how the sewing machines came together. Then, then after being at Bearley for a few months, Alison said, ‘Why don’t you come to Kingfisher Quilters? I think there’s a space there that you could, you know, you’d enjoy it.’ Another step on the slippery slope, and off I went to Kingfisher Quilters. And of course, they’re a workshop so one has to go to workshops. KH: Tell me about some of the workshops you’ve been to ’cause that would be quite interesting to know. KH: Is that machine or hand? JJ: That was machine. I have tried hand applique. I didn’t get on with that very well. I found that I’ve got arthritis in my fingers, in my hands and I find… found that trying to turn… do the… to turn under the fabric I find that quite difficult. So I’ve given that up as a bad job and gone on to machine applique. KH: And is, is that one of your favourites or is there something else that you like better? JJ: I enjoy the applique… yes, I think it is a favourite. I’ve just completed an animal quilt for my, for my granddaughter who is now eight months old and I started it a year ago [laughs] but, it’s taken me a long time to do, A long time to choose the fabrics and to applique those, the animals on. And, and to, and to quilt. So, that was done with vermicelli quilting which is all kind of squiggly as opposed to straight lines. KH: Define what it, how, how difficult is that? Perhaps, perhaps we ought to describe vermicelli. It’s a…? JJ: It’s, it’s free, free motion quilting use… and I use an open toed darning foot to do, to do that. It… and you just move your quilt, make a, make a random pattern. JJ: Of curves, yeah. For me, I find that quite… I enjoy doing it, I like the finished effect but if you’ve got arthritis in your hands it isn’t easy. You do a bit, you stop, you do a bit, you stop and it takes you quite a while to get the, to finish the quilt that you’re doing. KH: Yeah. Some Bernina and possibly other machines, I’m not familiar with, have a thing called a stitch regulator on it. Does yours have that? Have you ever used one? KH: Um, I… to be honest, I did most of the quilting at Bearley, so it was all done on the Janome which doesn’t have a stitch regulator [laughs]. Mainly because I was making this quilt as a surprise and my son and my daughter-in-law pop in and out and trying to hide it, I think, was also going to be a problem. Plus I often sew in the kitchen and we have a stone floor and at that stage we had a dog who tended to lie on whatever you had draped over the table onto the floor. So I decided I would do it where the floor was clean and where, you know, kind of where they couldn’t see what I was doing. KH: Is there anything about quilt making that you don’t like doing? KH: So you’ve… I’m just going through this. You’ve used paper piecing. JJ: Yep. Oh, I enjoy paper piecing. I’ve just made a double bed quilt of hexagons. All hand pieced and I find that’s nice to do in the evening while you’re… while the television or the radio’s on, it’s quite good to do that. KH: So, so you haven’t got any… I have, I have some pet hates, that’s why I was asking. What about using any… I’ve mentioned stitch regulators because I was, I was leading on to asking you this question… Do you use any technology, any, any sort of like, oh, I don’t know, computer programmes or anything like that with your… to help with your quilt making for design? JJ: No, no. I’m… I could be described as a Luddite. In fact, I probably am by my husband because I… apart from a computer which I work on, everything else is, you know, kind of… there’s no mixer for cakes, it’s called a wooden spoon and, no I, I… if I want to enlarge something, oh, if I want to enlarge something I will use a photocopier but that’s, that’s about it. KH: Do yo… how much time do you reckon you spend on quilting every week? KH: No, go on [laughs]. KH: So that’s about five or six hours there isn’t it? JJ: That’s five or six hours there and probably another ten hours probably at home amongst… I mean fitting it in with everything else I have to do. KH: You mentioned that you started out as an embroiderer and that you did cross stitch and tapestry. I’m, I’m going to say that I have heard that story more than once now. Do you apply any of that to… do you use it in any way with your quilt making? KH: Can, can you give a bit more of a description of that please? JJ: Right. Redwork, that’s where you trace a design onto a background, which I usually use calico. Again, I don’t have a light box, I use a window, so, just tape it on to the window and trace through. Then the, the design is stitched on with red thread. It was… by hand. It was an American invention, I mean, obviously you can do blue work or green work if you want, it just depends what you, what you… or variegated thread work and you use either stem stitch, backed, back stitch, maybe, chain stitch to get the desired effect and then I tend to either use a solid colour round the outside or then I would do just stitch it into some quilting. I’ve got several projects on, on my Christmas presents for that. KH: So you make smaller? JJ: I make smaller things with that. KH: Things out of that, yeah? KH: What sort of things? JJ: Wall hangings, little cushions, Christmas cards I’ve done, all sorts of things, yeah, which I enjoy doing again because I like to hand sew in an evening ’cause I, you know, I don’t like to shut myself away in another room. I, you know, I like, I like to sit with everybody and, and do my sewing. KH: Yeah, when you, when we were talking earlier we were talking about what do you spend your money on for quilting and we had a little laugh about that. What do you, what do you think? Of all the money you spend on quilting, whatever, I presume… maybe we could make a list of things you end spending. Because there’s the, the subs for the quilt groups and all that sort of thing. What do you think the bulk of it goes on? JJ: The bulk of it goes in the material that’s in the stack of boxes behind us. KH: You wouldn’t, you wouldn’t call that your stash by any chance? JJ: I would call that my stash, yes. JJ: Yes, I am a sucker for a lovely piece of material even if I don’t know what I’m going to do with it. And I do have quite a few pieces of material that I can’t bear to cut into because they’re rather nice. And I have hand dyed material as well. KH: Have you used those a lot? JJ: I have used those, yeah. Yeah, I’ve done, I did that with Edwina McKinnon, hand dyeing there and indigo dyeing as well. So I’ve done, I’ve done both and, enjoy doing that. But the latest… the… I’ve just now been spending my money on batiks because I’m going to do a Rose of Sharon quilt which will be all applique, so yeah, that’s where the money’s gone at the latest. KH: I suppose, I suppose the biggest outlay is the machine isn’t it? KH: The individual thing that can… I know you can spend a lot of money on the sewing machine but you don’t have to do you? KH: Fair enough. 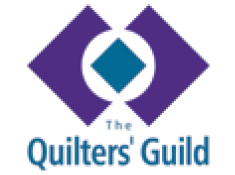 Do you… you mentioned didn’t you that you went to Quilts UK, the Malvern, the Spring quilt show. Do you, do you go every year? JJ: Yes, I do. Yeah, I go to the Spring and the Autumn. KH: Why, why do you think people go to quilt shows and why do you think they exhibit at quilt shows? KH: Do you think that matters? JJ: Yes, because I can see mistakes that I’ve made. Other people might not but to me they’re glaring mistakes and I’m a perfectionist and I want things to be right. And I… but having said that, I’m proud of what I’ve made but I just don’t know whether I would ever exhibit. I, I’m going to exhibit at the Kingfisher Quilt Show which will be this October and that will be the quilt that I did for my granddaughter, that, that will go there, so yeah. Why do people… other people go to quilt shows? Well, they go to look at the quilts that people have made to get inspiration. I certainly take photographs where permissible and come away with the little ideas of what I might be able to use again. Not necessarily in the same colourways but just, just a, a vague idea of maybe a block that will fit in somewhere that I could use. I also think that you go because of being able… the massive choice of material which you can’t get in an individual shop. KH: Yes, and the gadgets I suppose. JJ: And the gadgets, yes. KH: And things like that that are available. JJ: And also I find it very sociable. You meet up with people from all over the country and you sit and you have a coffee and you have a chat and it might be somebody that you’ve never met and never will again. That’s part of what I enjoy as well as going to the, going to the quilt shows. KH: What do you think of other quilters then? JJ: I think they’re very friendly. I think some of them are very critical and kind of say, ‘Well, I wouldn’t have done it that way.’ And, and I just think… I just go with an open mind and think well if you’re, you know, if, if you’ve worked hard at something and you’re prepared to put it up and have it criticised then, you know, I think you’re a fantastic person. No, I think quilters, all in all, are very friendly. I met some Japanese ladies this time who were most keen to show me what they’d bought. They were on a tour around Britain and somehow had managed to get… managed to leave their husbands somewhere behind and, and found out that it was the Malvern Quilt Show and had come along. And, yeah, they were really keen to show me what they’d got and what they were going to do and, it was lovely. KH: Have you sampled the little mini workshops that they have at the various quilt shows? Have you, have you done any of those? JJ: No, I haven’t. I haven’t done those, no. KH: So where do you, where do you look for workshops ’cause you have mentioned that you do them? JJ: Most of the ones that I’ve done have come from Kingfisher Quilters. I’m trying to think where else I’ll have been. I’ve done a couple with Edwina McKinnon and with what’s her name? KH: Can you tell me a bit more about this? JJ: Ah, right. That wasn’t a… [laughs] Yes, well, Saint Lawrence Embroiderers, what we normally do is, we do one year we make something for ourselves and the year… the other year we make something for the church, for Saint Lawrence in Alvechurch. And two, two pieces of my work hang there. We’ve made some banners to hang behind the choir stalls and I did a large panel, which was Jesus Fisher of Men. KH: And was that embroidery or quilting? JJ: That was appliqué, mainly appliqué but with, with machine quilting for the back, you know, to fix the background down. So that was done, that was, that was four years ago we did… I did that one. And last year I did another one which hangs in the ark which is… which are the rooms at the side of the church, another big banner. These banners are probably two foot six by about four foot. So they’re quite, quite big. I’d say quite a lot of work. We tend, we tend to manage most of them in a weekend but that’s working… we arrive Friday night, work till about 11:00 o’clock at night. Get up, start again about 7:00 in the morning, apart from mealtimes, coffee and tea we work through maybe till midnight. KH: So it… at West Hope you’re talking about? JJ: At West Hope yes, because we just… we don’t have a tutor for those, we just do it. KH: Do you have a plan? Does somebody have a plan that you’re working to? JJ: Yeah, yeah. You’ve been given a topic and then… and the size of the, and the size of the fabric that you’re going to use and then you go away and you design your piece. KH: Right. How do you… can you describe how you do that? JJ: Well, I, I must admit, that is when I’ve used the internet and I’ve looked at, looked at the topic and got some ideas on, on what I, what I want to do, then got a large… kind of got some A4 pieces of paper, stuck them together with… to make a large piece and started from there and drawn out what I want. JJ: I make a paper, a paper draw. KH: To the right size? JJ: To the right size and then I’ll… as, as with applique I’ll draw my design onto bond… the, the figures or whatever I’m doing onto Bondaweb and then iron that onto the material and applique that down. KH: Now probably most people know what Bondaweb is but, can you just describe what it is in case somebody’s listening? [Laughs]. JJ: Bondaweb, it’s, it’s… I would say it’s a, a fixer for material. It’s adhesive on two sides. JJ: You draw your design on, realising that your design is going to be stuck onto the wrong side of your fabric to get, to get the desired effect when you, when you decide to stick it onto your, onto your background fabric. You, you iron on very carefully because it can stick to the bottom of your iron. So you cover whatever you’re doing with a piece of greaseproof paper and your ironing board with a piece of greaseproof paper, iron on, cut out your design and then iron it onto your background material again with a piece of greaseproof paper between you and your iron. I learnt the hard way [laughs]. KH: I’m laughing because I’ve had to clean many an iron. Anyway, so right, you were talking… we were talking about at West Hope you go to… you go and you make these there. And you do that in the course of one weekend? KH: How many of you are there? JJ: No, I have no art background at all. KH: No training in it? JJ: No. I’m science background. I was an immunologist in a former life and then having had children decided to go into teaching. KH: Speaking of family have you… did you have a parent or grandparent or somebody who, who taught you any of this or and have you passed it on to anybody else yet? JJ: Nobody when I was growing up sewed, knitted, anything like that, they didn’t do any handicrafts at all. It was just something that I always knew that I wanted to do. I have my granddaughters; one is eight, one is five and one is three and then there’s two younger nine month, nine month old ones. The eight year old I’ve taught to crochet and to knit. She… the, the younger… the five year old is learning to sew using the plastic grid and she’s happily sewing away at that as is the three year old. But they call it knitting, so I haven’t had the heart to tell them that it isn’t knitting, it’s sewing. But they’re quite happy making mats for Mummy. JJ: Yeah, and Clodagh is the eight year old is now embarking on some embroidery. She’s very keen to learn. But my daughter has never showed the slightest interest [laughs]. KH: No. No, I do all the alterations of everything and for both daughter-in-laws. Yeah, so, yeah there’s just me and my granddaughters [laughs]. KH: So, how many quilts do you think you’ve made then in the course of your five years? JJ: Advent calendars for everybody, and then I think there’s about another six or seven that I’ve made, some that I’ve given away as presents for a close friend. We always make each other things for Christmas and one year she said the cottage she lives in is getting cold so I made her a, a lap quilt which she uses every day in winter. So, yeah, so yeah, I’ve done quite a bit and I’ve got about three or four things on the go. KH: I was going to say what do you have? That, that was my next question. What have you got planned for the sort of immediate future? JJ: Well, after I finish the animal quilt, nothing big at the moment. We did a Round Robin quilt which I can explain at Bearley. That was where you individually did the centre of your quilt and then it went on to somebody else, who you didn’t know. You just… everybody was given a number and the number came out of the bag and you… only one person knew who, who everybody was so you, you make sure that you didn’t get your own quilt and there were four other people put on borders round your centre. KH: And did they choose the fabric or? JJ: You, you could, if you wanted play the wild card and not put what you wanted in. I put in a fair selection of fabrics that I thought might match. KH: So the top of that’s finished and it’s ready to be made into a quilt? JJ: Yes. It’s, it’s, it’s, it’s all ready to be done. After that I haven’t really… well, I’m going to do the Rose of Sharon quilt, that is… that’s the next thing which will take me probably years with smaller things inter-spaced between it. But that’s, that’s my only, only project in mind at the moment. KH: Right. Well, unless you’ve got something else you’d like to add I think… I’d like to say thank you. I think it’s been very interesting and I’ve certainly enjoyed seeing this quilt and I admire how, well you’ve put it together [laughs] because it’s not something I could do. JJ: Thank you very much. It’s been a pleasure to do the interview.